America has Roswell; England has Rendlesham Forest — where aliens maybe paid a visit to US military personnel stationed there in 1980. 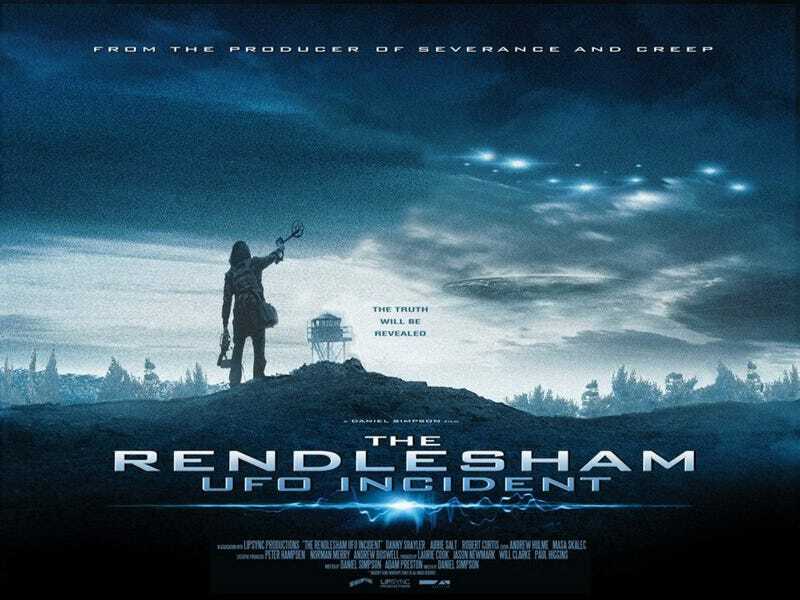 A new film, The Rendlesham UFO Incident, depicts a documentary crew that encounters eerie activity while poking around the same area. Rendlesham doesn't sound like a typical found-footage horror flick, however; for one thing, director Daniel Simpson is a long-time resident of Suffolk, where the forest is located, and he's described by the Telegraph as "a Rendlesham Forest incident expert." In the early hours of December 26, 1980, US military personnel (sections of the US Air Force were temporarily stationed at RAF bases in Woodbridge and Bentwaters) spotted strange lights above Rendlesham Forest. One of these men, John Burroughs, accompanied by his supervisor and one other individual, went to investigate the blue, red, orange and white lights. In his subsequent witness statement, published in 1981, Burroughs explains: "As we went down the east-gate road and the road that leads into the forest, the lights were moving back and they appeared to stop in a bunch of trees ... Also, the woods lit up and you could hear the farm animals making a lot of noises, and there was a lot of movement in the woods. All three of us hit the ground and whatever it was started moving back towards the open field … We got up to a fence that separated the trees from the open field. You could see the lights down by a farmer's house. We climbed over the fence and started walking toward the red and blue lights and they just disappeared." Another man, Jim Penniston, claimed to have encountered a craft "covered in hieroglyphic-like characters" the same night; the next day, the forest floor and nearby trees appeared to have been damaged, plus "radiation levels recorded at the site were unusually high." The subsequent audio tape is now considered one of the most valuable pieces of evidence in the Rendlesham Forest incident. The transcript of the tape runs to some 18 minutes but includes statements from Halt such as: "I see it too... it's back again... it's coming this way... there's no doubt about it... this is weird... it looks like an eye winking at you... it almost burns your eyes... he's coming toward us now... now we're observing what appears to be a beam coming down to the ground... one object still hovering over Woodbridge base... beaming down." Halt has since given interviews in which he claims that these occurrences were picked up by British radar. Then, on December 28, the final incident happened. Larry Warren, an 18-year-old soldier who was not even at either RAF base on the night of the first incident, was sent out on patrol with Sgt Adrian Bustinza and a number of other military personnel. Sometime after 11pm, the men departed their trucks and headed towards the field where lights had been seen on the previous two nights. There, Warren claims to have seen "disaster preparedness officers out here with geiger counters, going in an almost half-clockwise motion around this thing on the ground." A small red light was then seen approaching from the direction of the coast. "It moved in a downward arc, so fast. [It] stopped and hovered about 20 feet off the ground," said Warren. "It was the size of a basketball, [an] American basketball. [It was] self-illuminated, not quite red, yet that's the closest I can describe it." This red light suddenly exploded and a craft appeared on the forest floor. At this stage, Warren and Bustinza were asked to retreat. From a distance, they then claim to have witnessed Wing Commander Gordon Williams approach the craft and encounter some alien being with "what looked like eyes, facial features, bright clothing and some other device." Warren is clear that a "silent stand-off," rather than any communication, took place. Simpson appears conflicted about whether this is a military cover-up at a nuclear facility or something even more alarming. "I honestly believe something very strange went on there and I believe that somewhere is the evidence to prove it but that's hidden away. I think it's an extra-terrestrial encounter. I do." Check out the trailer for Simpson's film below; it's available via Amazon's UK site.